In his Stock Market Course, Gann had a section called the ‘Dow Jones Resistance Levels’ where he particularly focused on the Sharp V bottom of Aug 8 1896 low 42 up until the Final top of Sept 3 1929. The exact distance between the dates was 33.07 years, 396.81 months, 1725 weeks and 12078 days. Look within the circle and you’ll see lots of squares and oppositions between planets forming a Fixed Square/cross. This is a square within a circle – one of the shapes in Gann’s Emblem. When planets form such alignments, the energy is very difficult. Especially the fixed quality which adds more constriction to the natural flow of energy. The four fixed signs are Taurus, Leo, Scorpio and Aquarius. As a midday chart, you can see the dominance of Fixed in the grid below. Fire is also the dominant element which brings in the theme of heat and destruction. In comparison, the planetary energy leading into the high in 1929, there were more sextiles and trines with an overall balance in terms of qualities and elements. These simple techniques are often overlooked in chart analysis, however can help determine the energy level of the day.They are called chart signature patterns. Gann then mentions the End of the Great Bear Market. 1932 takes us to The Tunnel Thru the Air specifically from page 300. What is fascinating about this low was that it was one day before the exact trine of Jupiter and Uranus; the day the upward trend began both in fire signs. Looking forward now, some 55 years to the day of the low after the 1987 crash, what can we see that is similar to the 1932 low? 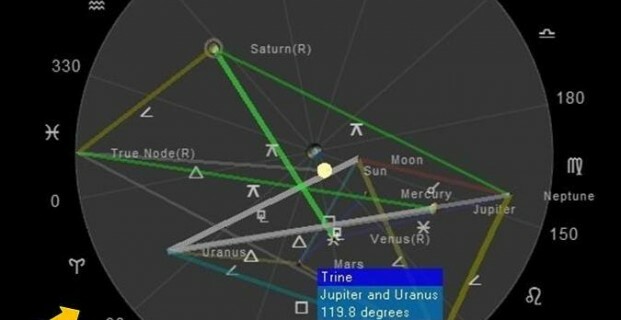 Jupiter is once again Trine Uranus and this time also to Saturn. Again we have the exact same degree of a fire sign. 23 degrees of the Fire sign is a very sensitive degree in these charts. At the High in 1929, Saturn was 23 Sagittarius, then at the low transiting Jupiter at 23 Leo Trine transiting Uranus at 23 Aries, formed a grand Trine with the natal Saturn in 1929. In 1987, we find these three planets again at these sensitive degrees in a FIRE sign. Below are the 4 charts overlapped in a quad-wheel, I know it can look a little confusing at first, however just observe the Grand Trine (green triangle) and the planets at 23-24 degrees in the Fire signs of Aries, Leo and Sagittarius at the three points. I will finish this article with a quote from Luther Jensen. pg 36 Astro-Cycles and Speculative Markets.